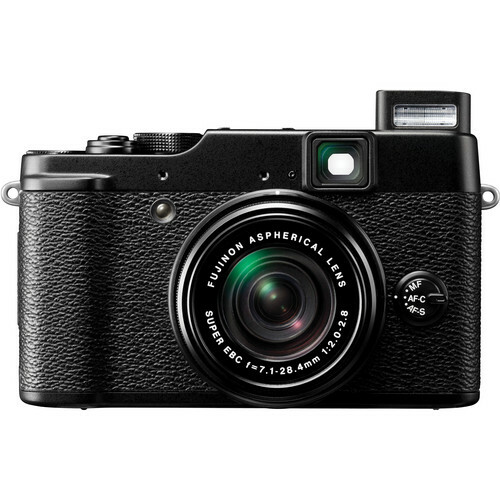 The Fujifilm X10 Digital Camera is a fun point-and-shoot that does more than its name implies. Designed with manual mode, HD video capture, and RAW shooting capabilities the X10 begs to be your creative option when a DSLR isn't the most practical option. As such, the X10 is of course lightweight, yet made from die-case magnesium, giving that a bit of that old-school look and feel. Adding to that look, and usability, would be the camera's viewfinder and built-in flash. It's also well equipped. As the aforementioned features suggest, this is more than a snapshot camera. The 12Mp 2/3" EXR CMOS sensor captures both high res stills and 1080p HD video. The lens is a 28-112mm (35mm equiv) zoom with an f/2.0-2.8 aperture and manual zooming capabilities. This Fujinon lens also features a proprietary Super Electron Beam Coating which ensures high quality image capture from any point on the lens. When you'd like to review images or shoot using the monitor, the 2.8" LCD screen has you covered. This display features high-contrast viewing that makes it easy to see, even when outdoors. No matter how you frame though the camera gives you the option to capture in RAW or JPEG formats. You can also take advantage of in-camera RAW processing. Film Simulation Modes area helpful as well to give you photos a look all their own. Additional features of the X10 include functions like the electronic horizon leveling gauge. This gauge ensures level images, without a tripod. Another useful option is the Motion Panorama 360° feature for seamless panoramic shooting. There's also the Fast power start-up for image capture in as little as 0.8 seconds. Box Dimensions (LxWxH) 6.9 x 6.8 x 3.8"
X10 Digital Camera (Black) is rated 4.3 out of 5 by 142. Rated 4 out of 5 by Rebel3 from Great Little camera I use to like the dslr features, then came the Fuji x10. While walking around with my D7000 was not always convenient, but now the Fuji X10 is my #1 choice: It's stealth, street photography, anytime everywhere is very conenient. The 2.0-2.8 glass at 28-112mm is a good range for every day use. you can double the zoom up to 56-224mm which is great for me. I sold my D7000 and bought 2 cameras, the D3100 and the fuji X10 with the money from the D7000 . the only down side to the X10 is the battery life is not as long,so make sure to get an extra battery or 2, I use the SD Card pouch to keep my 3 extra batteries for back up. Rated 5 out of 5 by Elohim from Awesomeness I went with this camera for street and travel photography where I do not feel like taking my 5DMKII. I chose to buy this camera over the micro 4/3 because it performs as well and in some occasions even better in low light than the EP3. I have no desire to carry around extra lenses when this does everything I need it to do, specially super macro. Notables, it looks and feels good to shoot with, the fill flash is nice, the IQ is better than any P&S out there and it's half the price of the X100. :-) I like the EXR Dynamic range options on there as well as the motion panoramic feature! Happy shooting! p.s If you need precise manual focus control, THIS is not the camera to get. Rated 5 out of 5 by Rich from Good design, pleasing image quality. Being the owner of Nikon 35mm SLRs, manual mode shooting is nothing new. I have delayed the purchase of a DSLR because of the size and weight factors. I like to carry a digital camera for casual street photography when ever I am out and about. I like macro work too. If you like the feel of a solid camera with good optics & good picture quality, the Fujifilm x10 should be on your short list. I am happy to have it and find I am using it more and more. Love the ability to control the focal length with the lens ring. There is something about the human interface with the x10 that makes me think about composition and framing the shot. Rated 4 out of 5 by Fuji Fan from New Sensors Still Not In Stock This is a beautiful camera and I will eventually purchase but returned this unit to B&H due to the sensor issue. No stores have new sensor models at present, so B&H is not by any means alone. Fuji will replace cameras with old sensors but the cameras need to be sent in for servicing. There is a substantial amount of misinformation regarding the new sensor camera availability which could be easily addressed by Fuji. Unfortuantely, to date they have refused to do so. B&H has been very good about the return, as always, and I will continue to recommend B&H for their excellent service and pricing. Rated 5 out of 5 by Scott ace from I love this camera! I am a amateur photographer and just love this camera. Its intuitive and natural along with being non-intimidating to people you may be photographing. Image quality is off the scale and the fast lens is typical Fujinon quality. I don't like the Fuji filter system for this camera as it has slots in the back that allow dust to possibly ingress so I put a 40mm-49mm step up ring and a slim fit 49mm B&W clear filter on instead. Theres been some noise made about wite orbs in some situations but after 2 weeks I have yet to see any. Super wll made and smal enough to fit in a jacket pocket yet big enough to hold on to. Battery life is not good but other than that-Excellent camera! Rated 4 out of 5 by big E from yes buy it love this little beauty. i mostly use it for casual shooting when not carrying a dslr. quick af, feels natural in my hands, usual fuji menu scheme but still penty of controls ON the body not hidden in menus. picture quality is impressive (only shoot raw)prints look great. the 360pano mode is very cool and fun. makes better video than my dslr. i am a tad worried about the on/off coupled to the zoom, it would be nice to leave the lens cap on and view pics without extending the lens (minor). i read other reviews that talked about the viewfinder, wow, its so whacky, doesnt seem close at all, like they said, just like dads old rangefinder. hahaha yes i really would buy it again, its great ! Rated 5 out of 5 by sdfotoguy from fantastic point and shoot I recommended a colleague purchase the x10 as he was looking for a quality point and shoot. He showed up to a shoot yesterday with it and we swapped cameras (my default is the x100). I've never been so impressed with a point and shoot in my life. The construction is as solid as the x100 yet the body is smaller and as much a joy to touch and shoot with, especially the metal zoom ring. Settings are delightfully retro in terms of the dials on top - as with the x100 - and performance is on par in terms of menus etc. it really feels like a small, zoomable x100 and for that reason I have a sneaking suspicion it'll end up in my bag as well. I've no need for one but it feels so darn good to use that I'd simply like one for those moments when a zoom is needed. Rated 5 out of 5 by Studer7 from It's like holding a mini Leica M9 I am going to use this camera for travel, and as a second to my SLR. I feel Fuji really got it right, feels great in your hands. The controls are in the right spot. Modern features when you want and Retro features when you want to go more manual. I love that you can turn the sound off and the camera makes no noise! The only short coming is the optical viewfinder, you see the lens a little, but I had this same problem with my Canon G11 and the Fuji is head and shoulder above the G11. I have added a red soft touch shutter button, 10.5mm UV and an old style screw in cord shutter release. This is the first point and shoot that I feel I could travel with without a backup camera! Nice job Fuji! The white orb issue with the Fujifilm X10 Digital Camera was resolved in the summer of 2012. All of our X10 cameras since then have the modified sensor. All of the Fujifilm X10 cameras in our inventory have the modified sensor. Hi! I'd like to know what's the Guarantee offered by Fujifilm for this product, how long does it last and if it's available in any country, as we might want to buy this camera in the US but will probably spend half of the year in Europe.Thank you! The camera comes with a 1-year Fujifilm USA warranty valid in the USA. For products taken outside of the United States, please check with the manufacturer locally, to see if they will honor the USA warranty. This is entirely up to the discretion of the manufacturer in question and out of the control of B&amp;H.